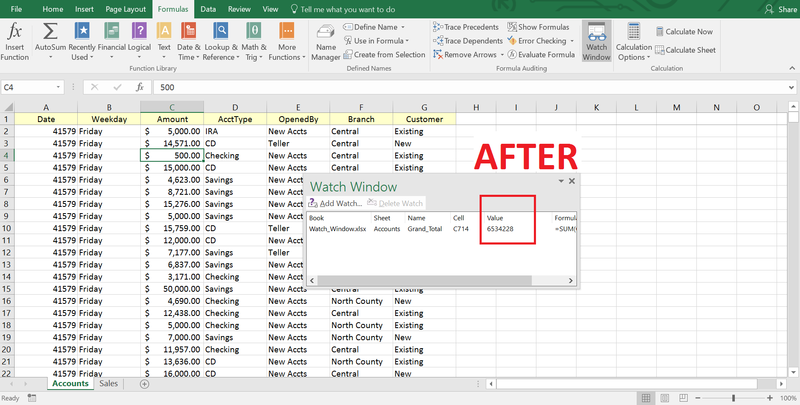 Monitor Cells with Excel Watch Window! Sometimes we have a great deal of data in the workbook. Everything is important but most important are the last row of the data containing, say, the daily sum of sales, or percentage of profits in each share in the columns. You may want to monitor the value of a particular cell in your workbook. But when you scroll down a big worksheet, or you move from one worksheet to another worksheet in your workbook, the cells that you wanted to monitor all the time disappear from your view. A feature, known as “Watch Window”, may help you out in this case. For example, there are 713 rows (of data) in this worksheet. The 7 hundred and 14th row shows the total amount deposited in several branches of a bank. 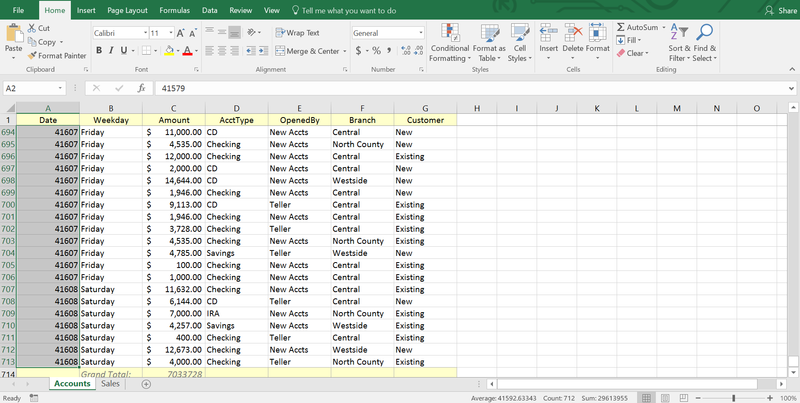 You may change some data in the amount column, and you may want to know what the total amount is, in that case. But for that, you will have to travel to that last row again and again which is inconvenient. You can use watch window in this case. Go to Formulas ribbon, then Formula Auditing group and click on the Watch Window command. Watch Window task pane appears. Right now there are no cells in the list. Click on the Add Watch button, Add Watch dialog box appears, for now, I select C714 cell and then click on Add button. You see the cell C714 is added in the Watch Window. Notice how I have named the cell (C714) as Grand_Total. You get the whole identity of the cell that you have added to the watch window. See the above image. 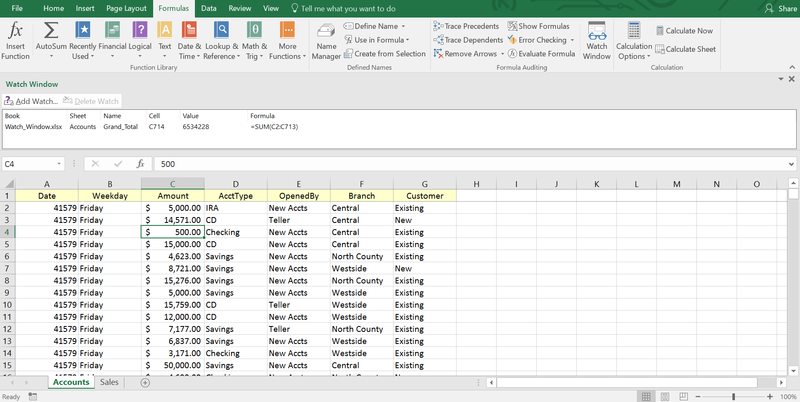 At first the name of the workbook (under Book column), then the Sheet name, if the cell has any defined name, you will find the name under the Name column, then the Cell reference, on the next column you will get the Value of the cell, and finally under the Formula column, you will see the formula if the watched cell has any in it. Now change some data in the Amount column, and see what happens in the watch window. I change the data in cell C4; I type 500. You can add multiple cells to your Watch Window if you need. Watch window is a task pane. You can dock this task pane at any place of your worksheet. Take your mouse pointer over the upper side of Watch Window, your cursor will turn into a 4-headed-arrow. Just press your mouse, drag and then drop where you want to place it. You see (from the image below), I have added the Watch Window below the Ribbon. To close the watch window, just choose the cross at the upper right corner of the window or click on the little down arrow and choose “Close” from the list. 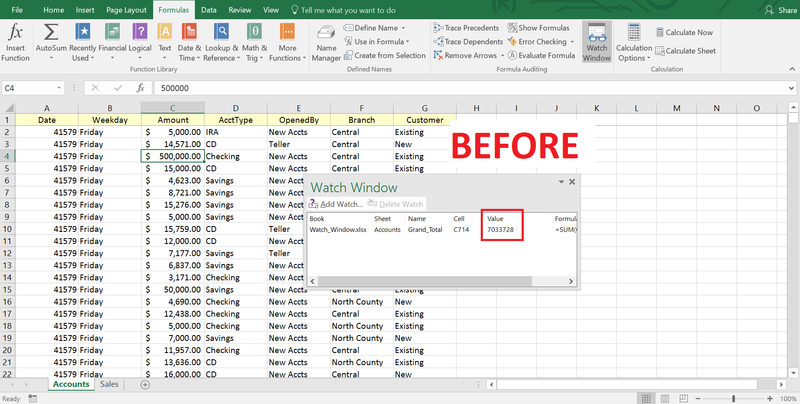 Excel remembers the cells that are in the Watch Window. Again, open the Watch Window, you will see the on-watch-cells are still on the list. 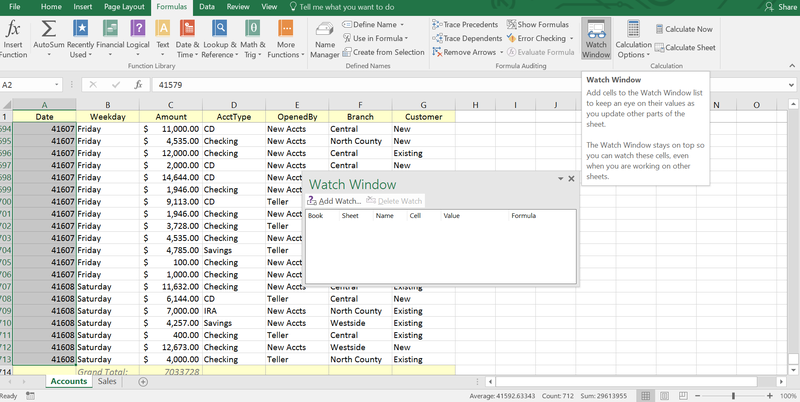 So, that’s it for today folks, Excel will be your watchman while you go change numbers and learn more about your business trends or patterns. Do give this technique a try and let us know how it reduced your work in the comments down below! 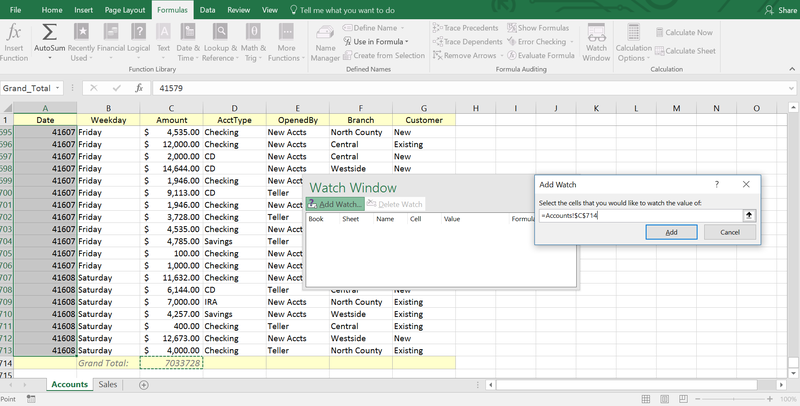 Watch Window Tip: Double-click a cell in the Watch Window to immediately select that cell. Open the Formulas ribbon → In the Formula Auditing group of commands → Click on the Watch Window command. Watch Window task pane appears. Click on the Add Watch button in the Watch Window task pane. Add Watch dialog box appears. In the cell reference field, refer the cell. Select the cells that you want to delete from the watchlist. Then click on the Delete Watch button. Click on the little arrow on the top right corner of the task pane. Then select Move command to move the task pane, Size command to resize the task pane and Close command to close the task pane. You can also close the task pane clicking on the cross icon on the top right corner of the task pane.